He is now exhibiting a heart-shaped black diamond, the largest black diamond of such cut in the world, weighing 115.34 carats. 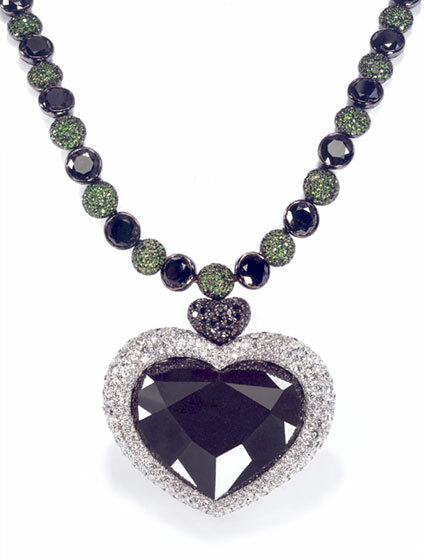 This heart is the centrepiece of a necklace made of 58.77 carats of smaller black diamonds, 378 white diamonds and 14.10 carats of tsavorite garnets, set in white gold. It took three years to cut the Gruosi Diamond. Received rough in 1998 from India and weighing 300.12 carats, it was originally planned to have an oval shape, but as cutting progressed, the material of the stone proved extremely fragile and very difficult to work. (This is not uncommon. The Amsterdam Diamond, another famous black diamond, is a stone whose rough form was originally intended for industrial use. When they tried to saw the diamond apart, they realized it was tougher than most industrial diamond material, a characteristic of a gem-quality black diamond. It was faceted from a 55-carat rough into a 33-carat pear shape.) Another famous black diamond is the 67-carat Black Orlov. The decision was made to cut this diamond in a heart shape, despite the considerable loss of carat-weight. In fact, the final weight loss after cutting and polishing was approximately 184.78 carats. This heart-shaped diamond was cut in Antwerp by one of the greatest black diamond cutting specialists in the world.